When it comes to climate change, much of the focus is on temperature, but there are other important changes happening including changes in the air’s makeup. 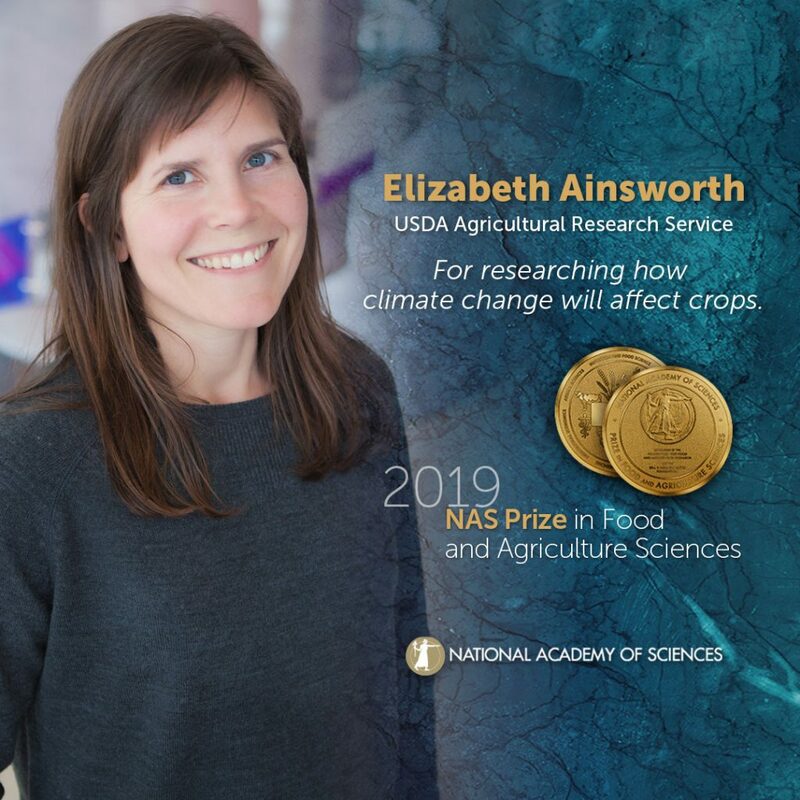 Plant biologist Dr. Elizabeth Ainsworth studies how rising carbon dioxide (CO2) and tropospheric ozone (O3) concentrations affect crop production and uses those findings to help ensure that there’s enough food for everyone in years to come. Ainsworth earned a B.S. from the University of California at Los Angeles followed by a Ph.D. from the University of Illinois at Urbana-Champaign and was a Humboldt Fellow at the Juelich Research Center in Germany. She currently works for the United States Department of Agriculture’s Agricultural Research Service (USDA ARS) and is an Adjunct Professor at the University of Illinois, where she is lead investigator of their SoyFACE Global Change Research Facility. FACE stands for Free Air Concentration Enrichment (FACE) and it allows her to grow plants out in the open (not confined to a greenhouse), but under atmospheric conditions simulating those that are projected to be present in years to come. Then she can study the plants’ responses at molecular and genetic levels to see what changes are occurring, which plants are surviving best, and how we can use that information to help maximize crop yields. In addition to her work in the field and in the lab, Ainsworth also works hard to educate the general public about climate change and started the Pollen Power Camp for junior high-school girls. Last week it was announced that she won the 2019 Prize in Food and Agriculture Sciences from the National Academy of Sciences (NAS). Her other awards include a USDA ARS Outreach, Diversity and Equal Opportunity Award (2015) and the President’s Medal from Society for Experimental Biology (2011). We look forward to congratulating Ainsworth in person when she comes to Cold Spring Harbor Laboratory (CSHL) to teach in the Plant Course!